Surfactin lipopeptide (SLP) from Bacillus subtilis KLP2015 (Accession number KT459335) was extracted and purified by ammonium sulphate precipitation, DEAE and size exclusion chromatography. 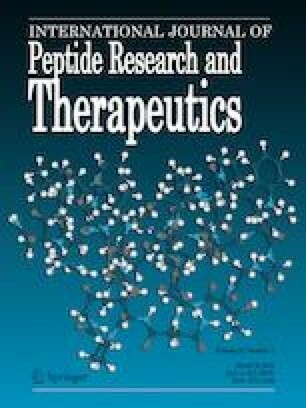 The molecular mass of the purified Surfactin lipopeptide was determined ~ 1000 Dalton through ESI-MS and MALDI-TOF-MS/MS analysis. The purified Surfactin possessed a strong cytotoxicity towards tested mammalian cancer cells HCT-15, Hep2-C, L-132, MCF-7 and NIH/3T3 with the percentage cell death of 80.1 ± 1.92%, 76.09 ± 1.32%, 88.56 ± 2.41%, 78.91 ± 2.09% and 77.84 ± 1.96% respectively and less cytotoxicity to normal HaCaT cells (31.45 ± 2.58%). A fivefold decrease in DNA content was noted in LP treated L-132 cells while twofold in Hep2-C after 20 h while, SDS treated L-132 and Hep2-C cells showed approximate 1.5 and 1.4-fold decrease in DNA content from its initial. The antibacterial assay using purified LP (concentration, 50 µg/well) of B. subtilis KLP2015 exhibited marked inhibtion of Klebsiella pnemoniae (15.0 ± 0.4 mm), Salmonella typhimurium NCTC 74 (13.0 ± 0.2 mm), Staphylococcus aureus ATCC 6538(12.0 ± 0.3 mm) and Escherichia coli NCTC 10418(8.0 ± 0.7 mm). The dislodging of biofilms formation was observed in all the 7 tested strains except Shigella flexneri. The maximum process of biofilm formation was reduced by 58% in case of S. aureus ATCC 6538. The authors are thankful to Department of Biotechnology (DBT) and Ministry of Science and Technology, Govt. of India and Department of Biotechnology, Himachal Pradesh University, Shimla for the financial support. KRM, was supported by Ph.D studentship from DBT, Govt. of India (Award No. DBT-JRF/2011-12/270).